look back on this Italian masterpiece. “Made in Italy.” These three words lend clout, sophistication and a sense of style to products that are fortunate enough to bear the stamp; in modern times, they might all thank Artemide. 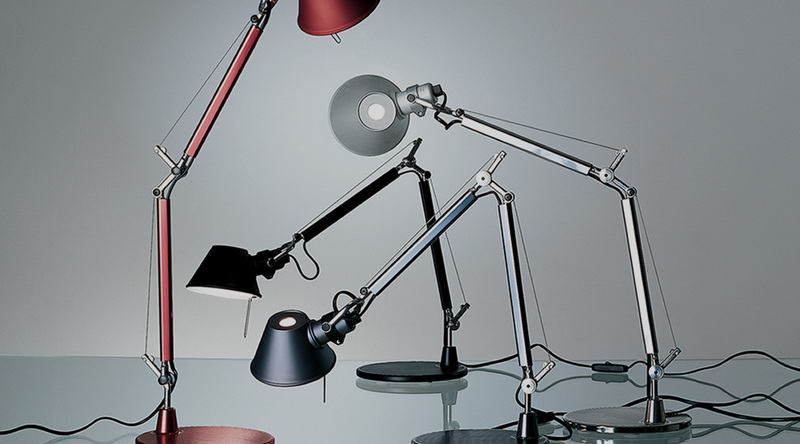 In 1987, the Italian brand launched the lamp that would become a phenomenon: Giancarlo Fassina and Michele de Lucchi’s Tolomeo task lamp. Designed at the dawn of the tech era, Tolomeo brought high design to the desks of architects and design professionals as well as the burgeoning dot-com industry offices. Its simplicity of form belies a painstakingly thoughtful design process that aimed to ensure ultimate adjustability and comfort for the user, traits we still value 30 years later. And as the Tolomeo reaches this milestone, we find that the design has never gone out of style, looking (and working) as seamlessly modern as it did when it was first conceived. The Tolomeo design itself seems simple enough—and perhaps that’s what makes it so radical. 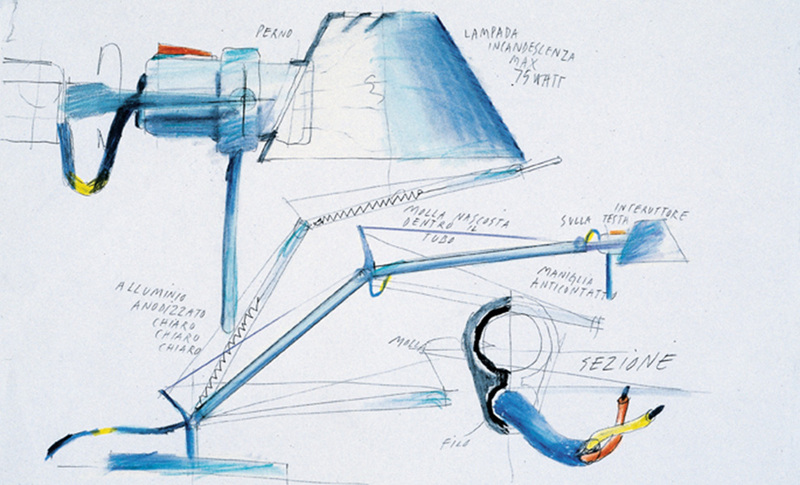 Michele de Lucchi made a name for himself among the anti-design movements like the Memphis group, whose bold, pop art-inspired creations polarized as much of the design community as it energized. His own studio, Produzione Privata, continues to champion his avant-garde ideals and ideas with artisanally crafted goods created with lasting use in mind. Giancarlo Fassina brought industrial design know-how to the equation, and the duo has succeeded in creating a new standard for modern Italian design with their collaboration, earning the highest honor in industrial design when Tolomeo won the Compasso d’Oro award in 1989. But let’s get back to Tolomeo. An unadorned conical shade. Articulated arms. Exposed joints. The design is deceptive in its simplicity; the head rotates 360 degrees, the visible wires along the arms control hidden springs inside—and let’s talk about customization. Tolomeo started as a task lamp, but it now comes in a dizzying variety of sizes, finishes in a rainbow of colors, lamping, base and shade options...the design is an icon of versatility as well as usability. In its all-metal iterations, Tolomeo’s slim silhouette smacks of techie sophistication, while the parchment shade version lends a warmer quality that suits modern living rooms as well as offices. The Tolomeo was among the cast of character’s on Showtime’s series Dexter. One of the best-recognized lighting designs of all time, Tolomeo is spotted on movie and TV sets with steady regularity. Everyone from Miami’s good-guy serial killer Dexter to Tony Soprano’s shrink had a Tolomeo lighting up their workspace. It’s a design that appeals to the tech-savvy, the scientific, the artistic and all points between—a modern iteration of a Renaissance-man, in lamp form. Fitting, considering designer Michele de Lucchi’s well-earned reputation for embodying the modern Renaissance man himself. To celebrate the 30th anniversary of the design, Artemide has issued a limited edition gold finish on the Micro task lamp, ensuring anyone can fit a piece of Italian design history into their space. On trend and timeless at once, the special finish fits seamlessly into the colorful Tolomeo line but stands out with contrasting metal and black detailing.